If the sardines are fresh it is advised you eat the whole fish (including the head). 1. To make the sauce, heat oil in a large frying pan over medium heat. Add onion and garlic, and cook for 5 minutes or until soft. Add wine, capers, tomatoes and bay leaves, and season with salt and pepper. Simmer, stirring occasionally, over low heat for 15 minutes or until thickened. 2. Meanwhile, place flour in a shallow bowl and season. Dip sardines in flour mixture, shaking off excess. 3. Place enough oil in a large frying pan to coat the base of the pan and heat over medium heat. 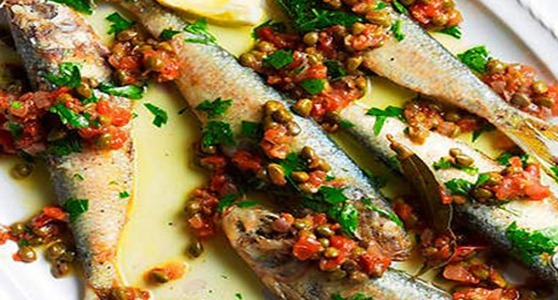 Fry sardines for 3 minutes each side or until golden and just cooked. 4. Drain sardines on paper towel then transfer to a plate. Spoon over Santorini sauce, scatter with parsley and serve with lemon wedges.